RapidNet is a high performance, pre-terminated system which utilizes proprietary bundled cables terminated to patented RapidNet cassettes. RapidNet cassettes snap easily into a RapidNet modular panel, which quickly latches onto standard 19" racks. Installing RapidNet is a snap - literally. Even though installations are completed in record time, quality and performance are never compromised because each individual link is terminated, labeled, and factory-tested by HellermannTyton in a strict quality-controlled environment. Certification test reports are included with all links, and RapidNet is provided with a 25-year system warranty. 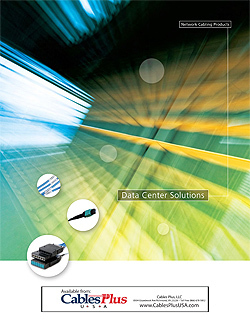 supporting Ethernet in high-security or industrial environments. RapidNet Category 6 is an ideal solution for high-performance cabling requirements, such as Gigabit Ethernet and 10 Gigabit Ethernet. RapidNet Fiber is an excellent solution for extremely high bandwidth needs or extended distances. Fiber enclosures are recommended for use on the connector end of RapidNet fiber cassette to connector assemblies. All RapidNet cassettes utilize our patented latch design to allow quick and easy installation into modular patch panels. Identification labels allow users to easily meet TIA/EIA-606-A and TIA-942 administration standards.